Child support is a monetary payment that a noncustodial parent pays toward the living expenses of their children. The amount of child support is based primarily on the noncustodial parent’s net income, although factors such as medical insurance costs, day care and school expenses and living arrangements can be considered. Although child support payments often can be agreed upon between parents, a knowledgeable Chicago family lawyer can explain how it is calculated and help you finalize fair, precise terms. The payment of child support is determined by the court taking into account the best interest of the child. It is not intended to be punishment for the parent that is required to pay support, nor should it be considered a windfall for the parent receiving support. There are a number of factors that impact the final child support amount and an experienced Chicago child custody attorney can help make a strong and reasoned argument that best supports your position. Some of the factors that the court may consider in determining a fair child support amount are the incomes of both parents, the custody arrangement as well as any special needs of the children. Not following a court order or judgment regarding child support can cause hardship to the other party. As a result, the Illinois court system takes these violations seriously, and a contempt action can result. Depending on the specific circumstances, consequences of a contempt action can include wage garnishment, money judgments and even possible incarceration of the offending party. If, for any reason, your former spouse fails to live up to his or her payment obligations, we can assist you with enforcement of court-ordered child support. If you are the non-custodial parent paying child support, don’t wait until the court holds you in contempt for failing to abide by the terms of your divorce settlement or court order. The child support attorneys at Hoffenberg and Block assist clients in Cook, Lake, DuPage, Will and McHenry counties in Illinois, and throughout the Chicago metro area to establish manageable child support agreements. We also offer experienced legal counsel in the modification and enforcement of existing orders of support. In the event of unforeseen circumstances such as illness, injury, loss of gainful employment or change in the child’s needs, a situation may present itself that requires a modification to the amount of child support to be paid. To modify a standing child support agreement, you need to prove that there has been a substantial material change in the circumstances for a parent or child. If you find yourself faced with one of the conditions mentioned above, our experienced family law attorneys can assist you with required document preparation and legal representation to petition the court in an effort modify the amount of child support you are required or pay or are entitled to receive. 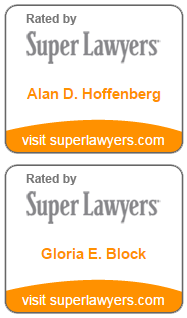 At Hoffenberg and Block, we provide personal, professional representation for a wide range of child support matters. Whether you need to establish child support or are in need of assistance with child support collection or modification, we are prepared to guide you through every step of the process. Our Chicago child support attorneys are dedicated to helping you obtain the best possible outcome to your situation. We handle spousal and child support cases in Cook, Lake, DuPage, Will and McHenry Counties in Illinois and throughout the Chicagoland area. To discuss your child support issue with an experienced Chicago Child Support Attorney, contact Hoffenberg & Block today at 312-853-8000 or Click Here to schedule a confidential case evaluation.